I don't typically gravitate towards pre-prepared food options. In fact, I've probably been known in the past to scoff at them. But we all know the only constant in life is change, and since having a baby my approach to dinner has definitely morphed a bit. Yet I still think it's super important to gather around the table for a somewhat homecooked, somewhat healthy, dinner. But I'm now occasionally okay with spending a bit more money on convenience foods to make my life a tad bit easier. As I was wandering around Costco on Sunday (why I went to Costco on a Sunday, who knows), my cart ended up containing a big bag of "super greens" and a jar of pre-made pesto. 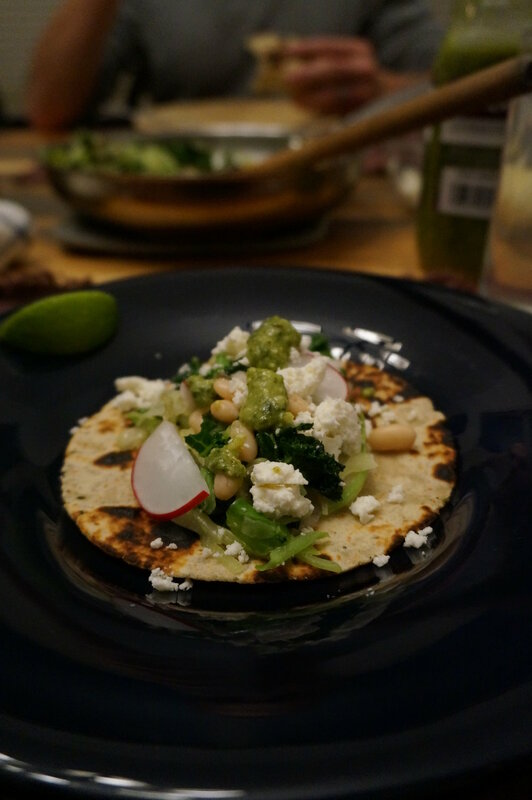 Both had caught my eye as delicious and healthy looking items, and I had the inspiration to use them together to make tacos some night this week.